Screaming Parrots - Parrot Tanmtrums & Noisy Parrots. My advise is simple... If you have sensitive ears or can't stand loud noises don't adopt or purchase a large parrot, specially a Cockatoo which can create a nerve wrecking situation for both you and the bird; at times ending on parrot tragedy. Always read and educate yourself as much as you can on the type of parrot you are trying to adopt. For some of us parrot owners, having the joy and blessing to parent a fatherly friend particularly a large parrot such a macaw or cockatoo comes at times with screaming loud parrot noises. Parrot Screaming can be natural response to his/her genetic environment- inner-natural clock or just plain parrot tantrum. Observing my own parrots; my harlequin macaw and my Umbrella cockatoo I can tell when theis screamming is a natural response to the environment and when is tantrum induce. Parrots are like 2-4 yr. old children, with the intelligence of sharp little critters, they learn quick, they have recollection of things and behavior and will respond negative to punishment . My Umbrella Cockatoo is a white fatherly ball full of love and parrot cuddleling, however from the beginning of times My Umbrella cockatoo will have his screaming sessions some mornings and specially every evening, when the sun goes down he starts to get little anxious. He dances around from his play pen, or large parrot cage ...this is his usual ritual every day, then after few minutes of dancing and bowing his head up and down his crest gets all upright and start his 15- 20 minutes screaming time. He has done this even before I adopted him, he comes from the Animal Hospital in Temecula California I worked years back, and faithfully for my cockatoo...every morning and evening was the same parrot screaming time; so I knew exactly what I was getting into when I adopted him. In the other hand my Macaw doesn't scream as my white cockatoo, she loves to sing really loud for about 30 minutes or more however if she wants attention or sees me busy with someone else and she decides she wants attentions right at that moment (yes, just like a 2 yrl old child) then she goes into those screaming tantrums for a while. One of my rescued front-head amazon parrots was so bound to me that every time I'll leave the room will trigger a series of long screams until my return ( I was the third owner for same reason) My Amazon parrot learned many words during his time, songs and dances but his screaming behavior never went away until he passed away of old age. Most parrot owners can leave with this type of disrupted peace in their homes; while other pet parrots is too painful an unbearable to their sensitive ears. Never punish your parrot, physical punishment will not work and will create aggression and will foment biting attacks on your feathery friend and/ or you can injure parrots fragile and complex skeleton. What I do through all this years as a parrot owner when my Cockatoo is telling the light of the day good-bye ( on his loudest screaming parrot way), I closed all windows and shutters in the parrot room, lower the tv volume and I leave the room. Most of the time after few minutes he is done with his parrot screaming ritual, he feels good and he is ready for playing time. If is tantrum base scream I usually go and talk to them, stay a while with them and the later I will give them something new and fun to chew on or a treat ( don't reward bad behavior by giving them the treat right a way) they do learn quick! and will scream every time they want a fresh treat..Yes, I do have my ear plugs as well! if a migraine is hitting me while the parrot screaming is going around; will leave the house to run some errands, go to the garage and do some laundry load or use my ear plugs. Cheap ear plugs can be found on the 99 cents stores. After the screaming crisis has passed away you can enjoy back your feathery friend; after all remind yourself why you choose to have parrot on the first place, parrots are smart, lovely critter, full of fun and energy. Enjoy & care for them! Please always use your best judgment, after all your know your parrot the best!. If You need a pet sitter for your bird, parrot macaw, cockatoo, parakeets, finches, lorakeets, conures, african gray, love birds,military macaws, pionus .. Yes dogs and cats too! I offer professional pet sitting service in Menifee California - treating every animal with love, care and respect. Hope you give me the opportunity to help take care of your pet in the future. 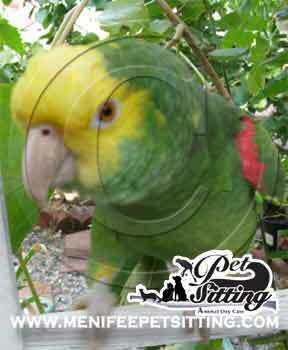 Professional and experience Parrot - Bird sitting Parrot Boarding in Menifee California. Space is limited for Pet Sitting Services in my home... Make your reservations on time for the holidays! Don't wait till the last minute by hiring someone inexperience on animal care and risking the quality care for your pet.